Atrene Camp is an empty campsite north of Anvil. Completely isolated on the grassy countryside north of Anvil, Atrene Camp provides quick and easy shelter but little else. It consists of a large tent, two bedrolls out in the open, and a large burned-out campfire surrounded by three stools. The tent contains nothing but a locked chest containing minor loot and, scattered on the ground, a pewter mug and a skull. Judging by the cobwebs found inside the tent, this camp has clearly been abandoned for a while. It is devoid of any inhabitants except for occasional wildlife passing by. 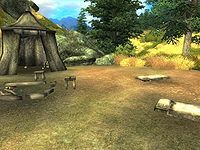 With shriveled grass and a few trees as the only vegetation in sight, Atrene Camp's only real attraction is its location; it is set up on the side of the unmarked road leading to Lord Drad's Estate, a short distance north of the Gold Road. Grommok's Journal lists "Camp Atrene" as the hideout of Grommok gro-Barak and his two companions. This page was last modified on 3 June 2017, at 18:28.